All the hardware is in and everything is mounted and I got a few test flights. But it needs to be tweaked since for now it's hard to control. I believe it should be easier. Basically this is the URL you're looking for on how to set up your KK quad in X configuration. 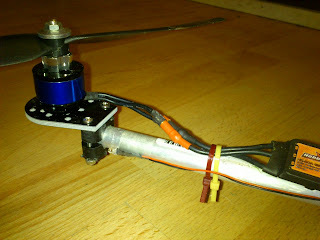 I already changed the way my motors were mounted. This is how it looks now. 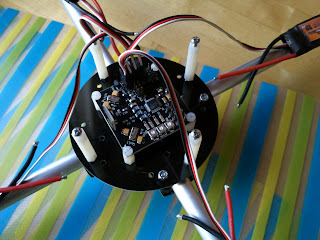 This way I can properly mount the propellers (no more prop savers) and the motors are better protected in case of crashes. You will break more props though. Don't forget to kill throttle on impact! I would like to find better booms also. These are 13mm booms while the holders are all molded to fit 12mm booms like used on HK 450 copters. They work but I believe real 12mm booms will fit better and give me a stronger frame. For now all shops either don't sell these in 12mm or they're out of stock. Looks like many multicopters are created these days. I need to fix that battery properly. It's influencing the center of gravity (it even shifts in flight) the way it's mounted on this picture. Like with any aircraft you want a good balance in the air. The best option to change the balance is by moving the battery around. 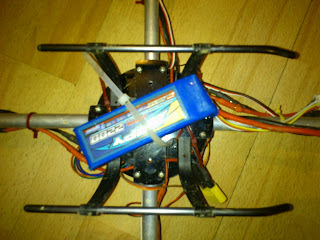 And if I review the mounting of the lipo I can as well review the mounting of the controller board. I have some adhesive foam pad in that I can use to tape it to the top of this frame. These plastic screws might still pass too much vibrations on to the controller. Besides that I will calibrate the ESCs again (I did it at some time but I'm not sure it really worked). And I'll play with the gain of the gyro's. You never know it might just need some more gain to be easier to control. Too windy these days to get it in the air though. Oh and don't forget to upload the latest firmware. With each firmware upgrade the platform gets better and better. 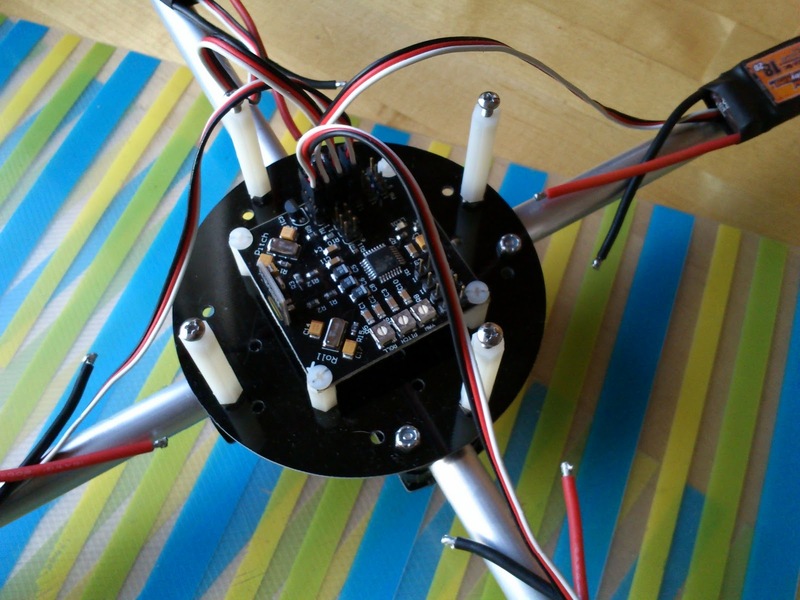 My board came preloaded with the Quadrocopter 2.2 firmware while 4.5 was already out.